Pesto Rosso for sale. Buy online at Zingerman's Mail Order. Gourmet Gifts. Food Gifts. The number one ingredient in this thick, concentrated sauce from Calabria is basil, but it owes its eponymous red color to plenty of sun dried tomatoes. The flavor of the basil and tomatoes coming together is like a hot, sunny summer day in a jar. The flavor is intense, so a thin smear on a slice of crusty toasted bread will go a long way. 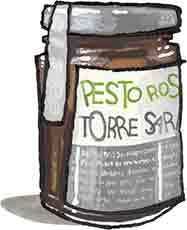 To dress a dish of pasta, thin the pesto out with a splash of the starchy pasta cooking water to make a creamy sauce. Or try a dollop over chicken, beef, or roasted vegetables.